We can happily provide a sample for you of almost any registered tartan. Just type which one you are looking for in the customer comments upon checkout. Not sure, have a photo, an idea, a question ? Feel free to email us and ask. We are historians as well and if we cannot answer your question, we will know where you can ask. 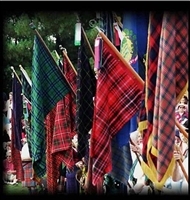 Please note, depending upon the availability and demand of the tartan, some requests may take up to 2 weeks to fulfill.